04/07/2012 - The Misano World Circuit, recently dedicated to Marco Simoncelli, will house the fourth round of the Italian Formula 3 European Series and the second of the Italian Formula 3 Championship. 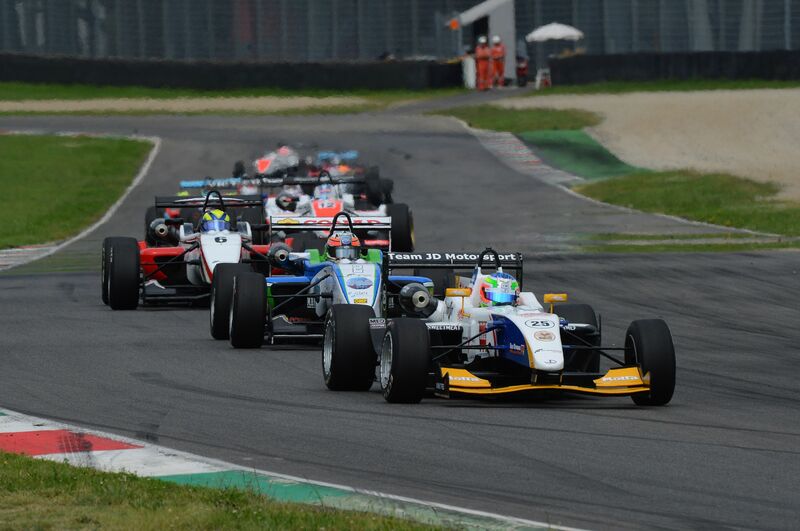 The European series will live the turning point of the season in Misano, with Eddie Cheever (Prema Powerteam) leading the charts at 114 points, ahead of his team mate Brandon Maisano at 91 and the rookie Riccardo Agostini (JD Motorsport) 10 points shy of Maisano. As compared to the race held in Mugello, the main novelties come from team Ghinzani where Kevin Giovesi will replace the Catalan Gerard Barrabeig, who decided to leave the championship after three rounds. The team led by Piercarlo Ghinzani will also have to race without Robert Visoiu in Misano as the youngest Formula 3 race winner will be competing at Silverstone in GP3. Patric Niederhauser will also have the same commitment after winning the first race in the Formula One support series in Valencia. Two cars will be lined up by team BVM then, one driven by the rookie Mario Marasca, on the podium in Mugello, and the other one by the French Maxime Jousse. Prema Powerteam will bring on track the complete line up made by Eddie Cheever, that is the leader both of the Italian Championship and European Series, the Frenchman of Ferrari Driver Academy, Brandon Maisano, who obtained his first win in Mugello, and the Brazilian Henrique Martins on the Dallaras powered by FPT. Two cars will be lined up by team Euronova led byVincenzo Sospiri: one given by the driver from Moscow Sergey Sirotkin, three times on the podium in this season start, and one to the Japanese Yoshitaka Kuroda. The Mygale lot will be made by the JD Motorsport’s couple Riccardo Agostini - Nicholas Latifi and the South African racing for Victoria World, Roman De Beer. Agostini will try to fill the gap on top of the classification after the great victory of Hungaroring and the two third places of Mugello. Latifi so far had a troubled season start but made a lot of progress in Tuscany which make the Italo-Canadian driver coming straight from karts feel hopeful. The weekend will begin tomorrow with 4 hours of testing. On Friday free practice will start at 9.35 (GMT+2) while qualifying will follow on Saturday at 9.25. Race one will start in the afternoon at 15.05 (live web streaming on www.acisportitalia.it, and recorded on Rai Sport 2 at 18.35). On Sunday race 2 and race 3 will be live on Rai Sport 2 and web streaming at 9.55 and 18.45.